For both, God’s creation of the best possible world, that is the world with the largest number of best elements, will entail evils also being present. “No world that reconciles all perfections is logically possible” (Mephistopheles: The Devil in the Modern World, p. 86). King and Leibniz part ways on the question of free will. Leibniz says that decisions are prompted by “previous representations of good and evil, by inclinations or by reasons”. King, on the other hand, argues that there is no cause of an act of free will. Free will is radically free. Like Samuel Clarke and against Thomas Hobbes King denies that consideration of all the possibilities determines our choices, and that the only freedom open to us is freedom of action (“freedom, not from necessity, but from compulsion”, Origin, “Of Moral Evil”, p. 189). Instead humans have the power of “election”; of making something good or bad by the power of choosing or not choosing it. So some things are desired by humans because they are good, but some are good because they are desired by humans (The Mod Squad: King’s Theory of Election). This means that our selection among possibilities is not deterministic in the way Hobbes and others suggested. This argument was pointed out in a paper which makes a surprising parallel: between Sartre and King (Creating Values: Sartre and Archbishop William King). Like the existentialists, King is saying that free courses of action create value. Unlike Sartre and other existentialists, King does not see this as a cause of anguish, but as the path to happiness. Since much of what a human wants is based on their choice, the option of not choosing what they cannot have is always open to them. This theory has interesting implications for hedonism. There are also parallels with Stoicism. In other respects, King was not much like Sartre. Born in Antrim to a Presbyterian family, he conformed to the Church of Ireland and became its staunchest defender. When James II threatened invasion of Ireland he was one of the few senior church men who stayed in Dublin, being given jurisdiction of the Dublin diocese when Archbishop Marsh left in 1688. Made Dean of St Patrick’s Cathedral in 1789, his resistance to James resulted in his imprisonment. His prison diary notes the presence of Michael Moore in Dublin. It was in prison that he wrote his best-selling work, aimed at encouraging allegiance to William of Orange, The state of the Protestants of Ireland under the late King James’ Government (published in 1691). He was made Bishop of Derry (1690) and while there wrote pamphlets with the aim of to pointing out to Presbyterians the error of their ways but which actually resulted in a long-running debate with Joseph Boyse, Presbyterian minister in Wood St Dublin. In 1703, King became Archbishop of Dublin, encountering Boyse again in the 1705 Emlyn affair. Their last debate was over Boyse’s The Office of a Scriptural Bishop, burned by the hangman in 1711. King campaigned for the material and spiritual well-being of the Church of Ireland, while supporting Irish legislative independence. He was hugely influential in Ireland in his time. The Origino made his name as a philosopher, and Hutcheson talks about the pleasure that book gave him in his introductory letter to King. King acted as a supporter of Hutcheson until King’s death on 8th May 1729. Addicted to book buying, King’s library forms an important part of the Bolton Library collection. 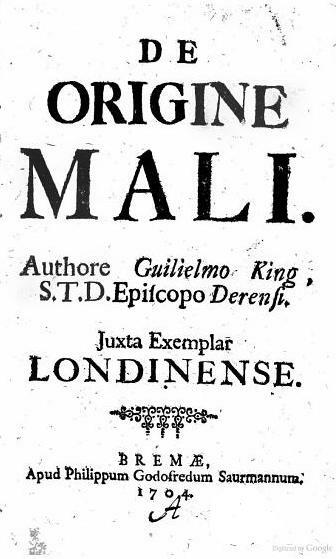 Despite the interest King’s De Origino Mali aroused in its time, provoking responses from Bayle and Leibniz and influencing Hume, it is largely forgotten today. That fate shared by its author. The name of Archbishop King’s work lingers on in a critique of it appended to Leibniz’s Theodicy. William King, (1731) Essay on the Origin of Evil, translated by Law. (google books). Jeffrey Burton Russell (1990) Mephistopheles: The Devil in the Modern World, Cornell University Press (preview on Google Books). See pp. 84-88 on Leibniz and King. RICORSO: William King (includes publications and quotations about King.